Courtney and Ryan had their dream come true to come to Orlando and have their wedding at Walt Disney World. There in the wedding pavilion they walked the aisle, took their vows, and became husband and wife, in front of their family and friends. 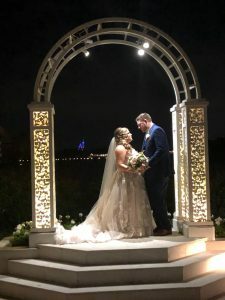 With beautiful florals in blush and ivory from the Walt Disney World Florist, the Wedding Pavilion looked amazing, and with the sun setting and fire works going off at the Magic Kingdom it was a sight to behold. The couple asked Rev.Glynn Ferguson a minister and officiant with Sensational Ceremonies to help them create a custom ceremony, rich in love and laughter. He gave them a homework assignment to write and tell him why they loved each other. Courtney wrote: Ryan and I met in 2005 at our high school orientation, we exchanged our phone numbers and Aol instant messenger screen names and within a few short days he had even asked me to homecoming. I said yes but as the weeks went by and he grew more interest in me, i backed out of our date, told him he was a stalker and decided there were likely way better guys in the world that I needed to spend the next 8 years trying to find. In those 8 years, i couldn’t have asked for a better friend. Several years had gone by where we barely even looked at each other but by the end of highschool, I couldn’t name a time that Ryan wasn’t right there when I needed him, even when I didn’t know I did. To this day, that has never changed. In 2013, I needed a roommate and he needed a place to live, having been close friends for a while at this point, it was a match made in heaven. We made it about a month and a half living together until we both realized how much we deeply and UNCONDITIONALLY we loved each other.. I spent years praying and praying and praying some more for the exact man that Ryan is and he had been there the entire time. There is something to be said for growing up with someone before you fall in love and I certainly believe our journey as friends built the strongest foundation for our life as a couple. He is the most patient, selfless, caring, generous and kind man I have ever met and on days when I can’t even stand or love myself, he never fails to do so. He continuously keeps me grounded, but knows exactly when to let me run wild and he always steps up to be the grown up in the times where all I want to do is be a kid. I don’t doubt for a single second that God made us for each other and wove the fibers of our lives together, and that is by far the best feeling I have ever felt. Ryan wrote:From the minute I laid eyes on Courtney, on that hot summer day in the Cardinal O’Hara cafeteria, I knew there was something special about her. The move I had made that day changed my life forever…….. I asked her for her AOL Instant Messenger screename. From there the rest is really history. Since then we have shared so many great and not so good memories, but it’s the great memories that really stick with me, while the not so good memories only made our bond stronger. I could probably write a book about us thus far in life, but I’ll try to keep it short and simple. It is amazing to think how far we have come, how much we have grown, and the things we have learned in what seems like a short period of time. If there is anyone in the world who can put a smile on my face, Love in my heart, or a Disney transaction on my bank statement, it is Courtney. It is hard to put in to words the feelings I have for Courtney, because there isn’t really a way to explain these feelings. Feelings like that time your high school crush asks you to be roommates with her, or when your best friend asks you if you have special feelings for your roommate, thinking in the back of your head “she definitely put him up to this”. I was experiencing a newer feeling that I hadn’t quite felt before, and the same still holds true today, where I can’t wait to leave work or school and come home to see her, and just share that time together. She has this fun-loving way about her where I forget about all that is bad in world when I am with her, and all the sudden due dates, project deadlines, the bills just don’t matter. She is such a free spirit, which is exactly what I need to prevent me from being completely grounded by facts and the idea that there is no gray area, and that things are right or wrong, 1 or 0’s, etc… Even if she knows I am wrong about something, she will defend me to anyone, and then later let me know that a person may have been right in a situation, but reinforcing that she will always have my back in any given situation. Some people spend years searching for a that “rock” in their life, but my rock was placed in front of me on my first day of high school, and while neither of us saw it through back then, what was meant to be certainly came to be at the end of day. In loving Courtney I have learned that love can come of out nowhere and really sweep you off your feet, love has no days off and is something that will be there even if the deepest of disagreements, but we know that we cannot ever go to bed with the slightest anger for each other, and that I love you is not just three little words, but that actions and reactions that we share with each other on a daily basis. Courtney is beautiful inside and out, and if there is anyone that I cannot wait to spend the rest of my life with and bring new life in to this world with, it is Courtney. We wish them their happily ever after!! !